Lorac Cosmetics has just released three new Unzipped palettes ($42) and if you're a fan of the originals, you're probably just as excited as I am! Mountain Sunset "embraces the bluffs through richly hued shades inspired by breathtaking sunsets, rich flora, and the crystallized inner workings of nature's most impressive structures". Ocean Sunset "embraces the call of the sea through richly hued shades inspired by sea-foamy shores, majestic sunsets, and the alluring mysteries of the deep". Desert Sunset "embraces the badlands and heat through richly hued shades inspired by radiant sun-rimmed mountains, striated cirrus clouds, and alabaster stretches of sand that shimmer at sunset". They're currently sold out at LoracCosmetics.com but they'll be launching at Ulta Beauty very soon...I'll keep you posted! These look so pretty! They sure sold out fast, and I look forward to seeing them in person in Ulta. Btw, I was browsing Ulta's "what's new" page and saw new Lid Lingerie from Nyx in 12 MATTE shades. I'm hoping they'll be a good alternative to much more expensive cream/liquid eye tints, plus there's a beautiful-looking olive green. Hi Sue, yes I was disappointed at how fast these sold out. I guess I'll wait for Ulta to stock them. I just placed an order for those NYX Lid Lingeries because they were BOGO 50% off (and I got the olive green one!). They are all so beautiful! At first I thought that Mountain Sunset was my pick but the more I kept looking the more I liked them all. My poor wallet!! 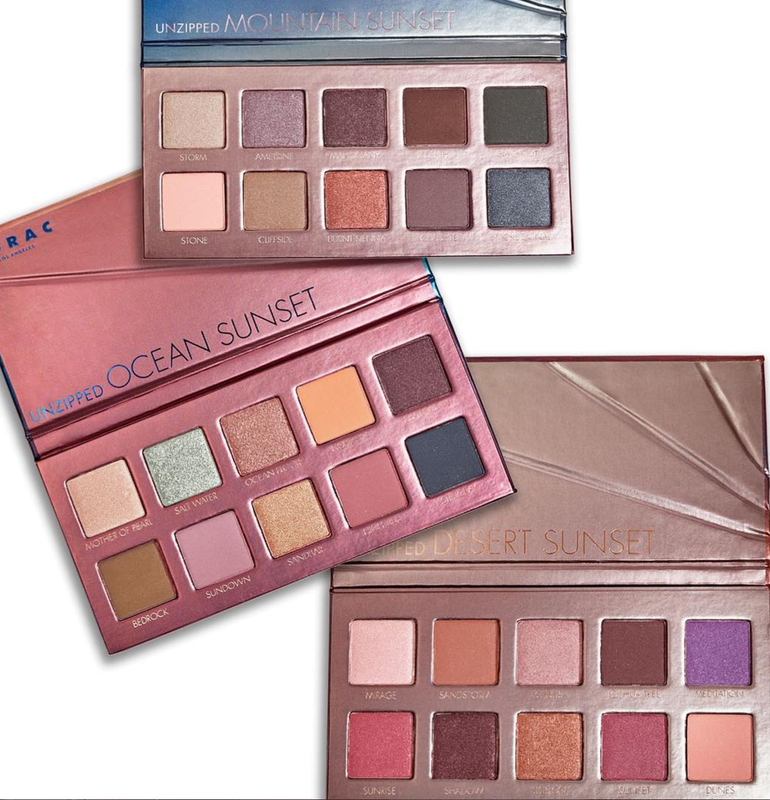 It's hard to pick, but I think Ocean Sunset is calling to me. I'm trying to decide if I should use my Ulta points to cover it when it releases. That's a good idea...I wish I had saved mine. I wasn't thinking that these would be arriving soon. I just placed a big order and used my points on it. :/ Oops! Hey Jen! Have you seen that Hourglass is coming out with a Nordstrom exclusive palette for their upcoming sale? I thought it'd be something you'd be interested in! I ended up getting all three. Trendmood posted swatches and got me all excited. So excited I bought them about 10 minutes after the launch. They are supposed to arrive Friday. I'm excited. I think the theme got me, just love a good sunset. Would You Spend $50 on a Drugstore Palette? Sleek MakeUP Now at Walgreens! Tarte Friends & Family is Live Now! Macy's Black Friday In July Sale Starts Today!